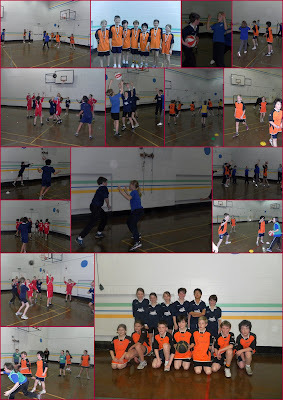 The two Earl Soham teams did themselves proud with a series of scintillating performances during this morning's basketball tournament. After a rather slow start, the points total started to steadily increase every time they stepped onto the court. With sweat running down their brows and smiles beaming from cheek to cheek, Earl Soham became more and more competitive, fluent and effective. Roared on by a large contingent of their parents, the children simply revelled in the environment which saw them at their best. By this I mean that they took a few early knocks in the opening games, but dusted themselves down, rolled their sleeves up, learnt from their experiences and flourished. Our two teams did magnificently well to finish 3rd and 4th. To be honest, on the way back to school it felt like we'd won. I'm very proud of all 13 of you! This was such a brilliant event, I thoroughly enjoyed it, although to start off with I thought it was going to be a disaster. It was so good to see the teams cheering one another on but it was also good to see the competitive edge coming through when they played one another. I think the children will be buzzing from this for a while. I am very grateful that the school allows us to come along and spectate, even with the amount of noise we make.